Early this year we ran a test on the leading property Apps for the iphone called Findaproperty app vs Rightmove app. Then more recently we reviewed Zoopla Iphone App. 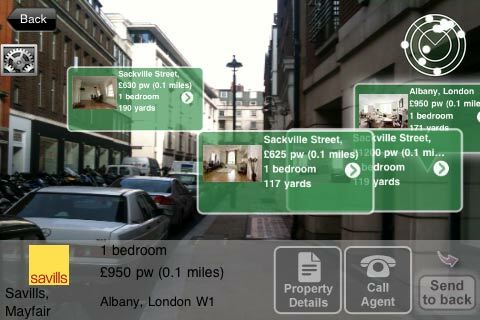 FindaProperty iphone app now comes with augmented reality, which is a massive step forward in usability. So what is augmented reality and how does this enhance the App? FindaProperty.com’s app had a few hiccups with geolocation last time and had a few issues to address, we hope version 3.0 would resolve our concerns. Augmented reality is the technology behind many Iphone Apps combining a view of a physical real-world environment whose elements are augmented by virtual computer-generated imagery. The result is the App uses technology functions by enhancing one’s current perception of reality. The augmented reality view – this is built in as an alternative to search and list or map view. The user can see properties within half a mile of a radius overlayed on their screen. Also the property details have a cover flow mode view. This is accessed by simply turning your iphone horizontally into landscape mode while viewing details of a property. Similar to the Zoopla App, users can select a specific property and see details or directly choose to call an agent. In all the improvements are obvious are very much needed. FindaProperty.com’s iPhone app is extremely usable. The iPhone app screen shows labels of potential properties nearby, each label tells you details of the property, house prices, number of rooms and a thumbnail photos , all just a click away. Last time we tested the Findaproperty App we felt it was good in providing search results and was a stable application with details of over 783,000 properties from over 11,000 estate and letting agents. It continues to be a very usable app compared to Rightmoves. FindaProperty.com’s app failed in the use of geolocation last time, which has now been put right in version 3.0. It also struggled against viewing of property photos and details in the previous version, this agian has had a vast improvement. Like the Rightmove app that enabled direct call to the agent, FindaProperty have addressed this in v3.0. Summary: FindaProperty.com’s have addressed our concerns and this iphone app has certainly gone to the front of the pack!